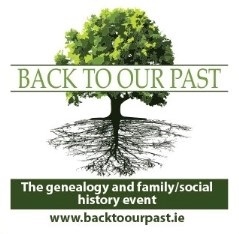 Despite intending to be at this year's Back To Our Past (BTOP) and Genetic Genealogy Ireland (GGI) conference at the RDS in Dublin, events have conspired against me and I won't be able to attend. 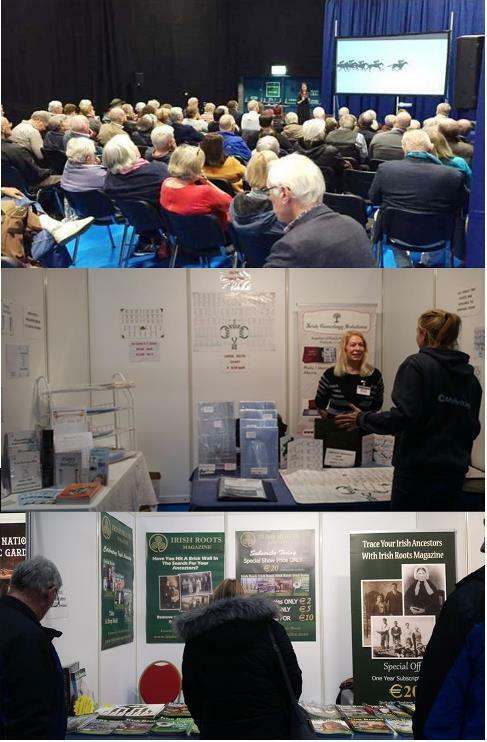 But I've been in touch with some of those attending the show and all seems to be going well: a happy, busy atmosphere, with lots of help and guidance being freely dispensed to family historians of all levels by knowledgeable genies on the exhibitor stands and in the lecture halls. There are also loads, and I mean LOADS, of special offers to be had, whether you're after DNA tests, genealogical society memberships, database subscriptions, stationery supplies for the researcher, family history magazines and books, or pretty much anything else. From what I'm hearing, visitor numbers look pretty good despite the downpours and gales being thrown down on Ireland courtesy of Storm Brian. I've managed to beg and borrow some photos to give you a feel for the show, so if you fancy popping along tomorrow when the weather is likely to be bit quieter, you'll know what to expect. The Shelbourne Hall doors open on Sunday at 11am and the show continues until 6pm. 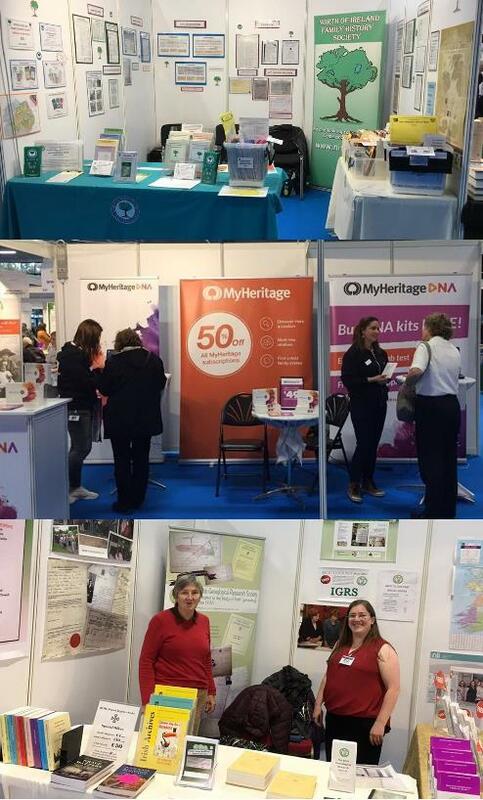 Check out the lecture programmes for the day (Genetic Genealogy and Traditional Genealogy/Heritage), and be sure to allow yourself enough time to visit all the stands and attend a selection of talks. stationery needs covered; Bottom: Irish Roots Magazine - Ireland's only independent family history magazine. Irish Genealogical Research Society's fabulous raffle prize worth €1,000! 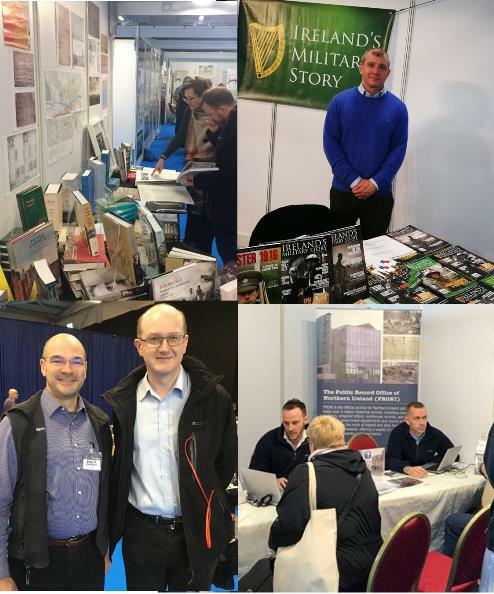 Clockwise from Top Left: Books galore on the Royal Irish Academy's stand; Wesley Burke, Editor of Ireland's Military Story magazine; Maurice Gleeson, co-ordinator of Genetic Genealogy Ireland conference with Cathal McElgunn, visiting geneticist; Find out how the collections and resources of PRONI can help your Northern Ireland research. 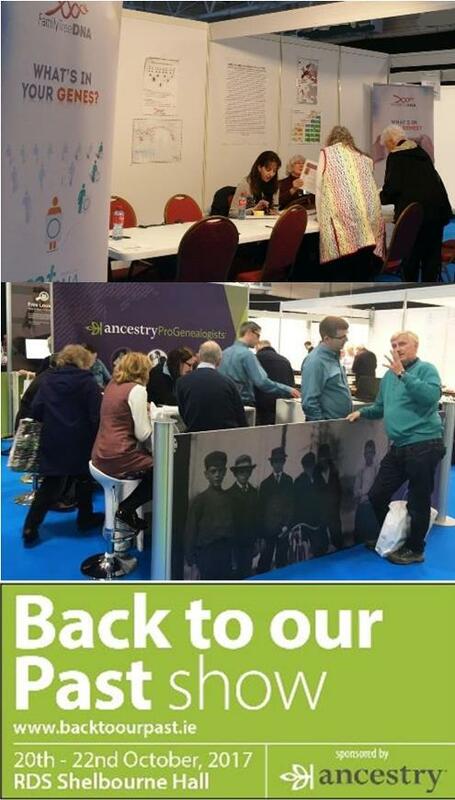 Top: Family Tree DNA sponsor the Genetic Genealogy Ireland conference. Middle: Ancestry's ProGenealogists team in action, busy busy busy. Bottom: BTOP is held as part of the Over 50s show at the RDS.